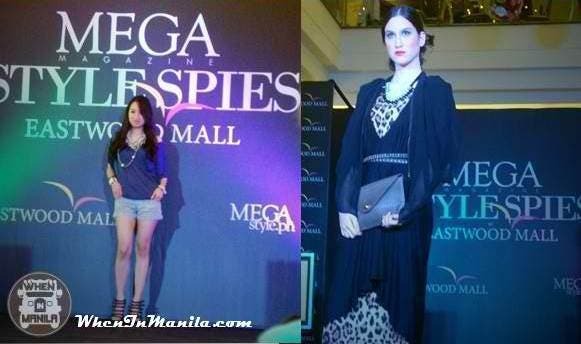 When In Manila, fashionistas and bloggers gathered to see what’s in store at Eastwood Mall. Last Thursday September 29, Mega Magazine, Megastyle.ph and Megaworld Lifestyle Malls launched their latest fashion venture, “Mega Style Spies at Eastwood Mall”. Everyone including myself is very curious about this so called Mega Style Spies. It was then revealed to us that the Mega Style Team is on a mission and will lurk around Eastwood Mall every Friday (from September to December) to spot and take a picture of the best dressed shoppers, and be featured on Megastyle.ph. This sounds fun right! So ladies and gentlemen, next time you’re shopping in Eastwood mall be on your most stylish and get this chance to be spotted by the Mega Style Team. And yes you heard it right, the gents are very much welcome to dress up and be spotted; this project is not just for the ladies but for everyone who wears their sense of style. And if you’re wondering how stylish is “stylish”, they gave us a glimpse of the editor’s style picks done through a fashion show featuring ensembles from Girl Shoppe, Maldita, Folded and Hung, Mental, Celine and Luca. So When In Manila and you’re headed for shopping, put on your fashion foot forward, drop by at Eastwood Mall and you might just get this chance to “be seen” on Megastyle.ph. COOL: This incoming college student tried to visualize a ‘Beep’ app, and it’s AMAZING!